The name Tuls has been associated with dairy farming for generations. 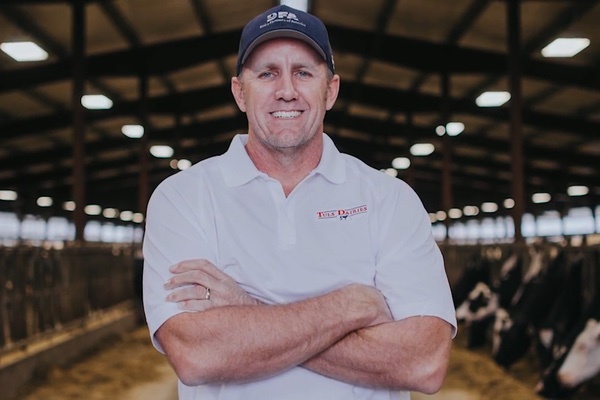 Todd Tuls is a third generation farmer who has owned and operated dairies all across the country. Tuls Dairies pride themselves on producing quality, healthy milk from well-cared for cows. Their state-of-the art dairies follow the highest standards of stewardship and effective management. That sense of pride is deeply ingrained in the Tuls family. Todd Tuls’ grandfather was a farmer in Holland. Todd was raised on his parent’s 400-cow dairy farm in Chino, Calif. He grew up doing farm chores and was feeding calves when he was in elementary school. When he was 10, Todd’s family moved to a larger farm that eventually grew to 3,800 head. From an early age, he learned from his father how to properly manage large dairy operations. After graduation, Todd continued working on his family’s dairies in California, Nevada and Kansas. In the meantime, Todd and his wife began raising the next generation of Tuls farmers. In 2000, Todd and his family moved to Nebraska and formed Double Dutch Dairy. Since then he has established Butler County Dairy as well. More than 10,000 cows are milked at his two Nebraska dairies. Both Double Dutch and Butler County Dairies work closely with area farmers on crop production and nutrient management. Todd and his son T.J. began operating the approximately 5,000 cow Rock Prairie Dairy near Janesville, Wis. in late 2011. Tuls Dairies also operates two other Wisconsin dairies — Emerald Sky Dairy in St. Croix county and Pinnacle Dairy in Green county. Todd Tuls has reached a life-long goal of milking over 20,000 cows at his various family-run dairies. Todd Tuls’ success is built on a devotion to his cows and the land and his ability for turning lofty dreams into solid reality. For generations the Tuls family has been dedicated to farming, and it will remain committed to agriculture for generations to come.